"Model Master Flat White F.S. 37875"
MM Flat White is a great product when trying to mix paints. 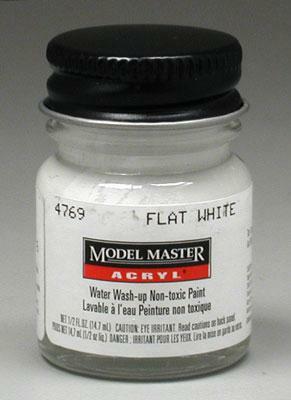 Acrylics are easy to mix, making the MM acrylic paint line good. Also, many instruction books ask for this specific paint (F.S. 37875) in their painting guide. F.S. stands for federal standard colors. Model Master acrylics are great for areas with little to no ventilation. Works well with both airbrush and paint brushes. Clean up is easy. I have used Tamyia and Testors Model Master paint. I prefer Testors because I think it flows better and covers better than Tamyia. I will continue to use Testors.